HI!! I am so ridiculously excited to share this with you I can hardly type this without shaking with glee! Ji Baek from Rescue Beauty Lounge has made some very lucky girls (her ReBeLs) ecstatic by creating their dream nail polish color, making the polishes into The Fan Collection by RBL! A little more than a year ago Ji put the challenge out for anyone to submit an idea for a custom nail polish color to add to her product line. She narrowed the selection down to eleven color ideas for everyone to vote on, so it truly would be a collection made for the fans! The vote was supposed to be for the top three, but the fourth place idea was only a vote away from the third place spot, so Ji made four for us instead! The first of the collection, Halcyon, is an idea submitted by Danielle: "Danielle's dream color is a soft, sage green with a pink glimmer of brilliant reflective shine, just like when the morning dew tenderly kisses a succulent plant. The beauty of succulents keeps her calm and serene." I absolutely fell in love with this color when her idea was up for voting and have been anxiously awaiting the product to come to fruition ever since I found out it won last year. The muted sage green base is beautifully illuminated by the gorgeous pink micro-glitter, which flashes warm gold/copper at times warming up the color nicely. This swatch is two coats with topcoat. Next is Aqua Lilly, imagined by Kaydi-Kat. In Ji's words, "A few years ago, I was lucky enough to visit the Kuda Huraa Island of the Maldives. The turquoise water is a crystal-clear sea green and what really had me spellbound was that it reflected a shimmery-pink hue from the shedding scales of the colorful, vivid, and exotic tropical fish. This color is Kay-Di Kat’s homage to her beloved mom, Lily, an Aquarius who swims like an enchanting mermaid. I imagine Lily swimming in this paradise with its mesmerizing water in the Island of the Maldives." 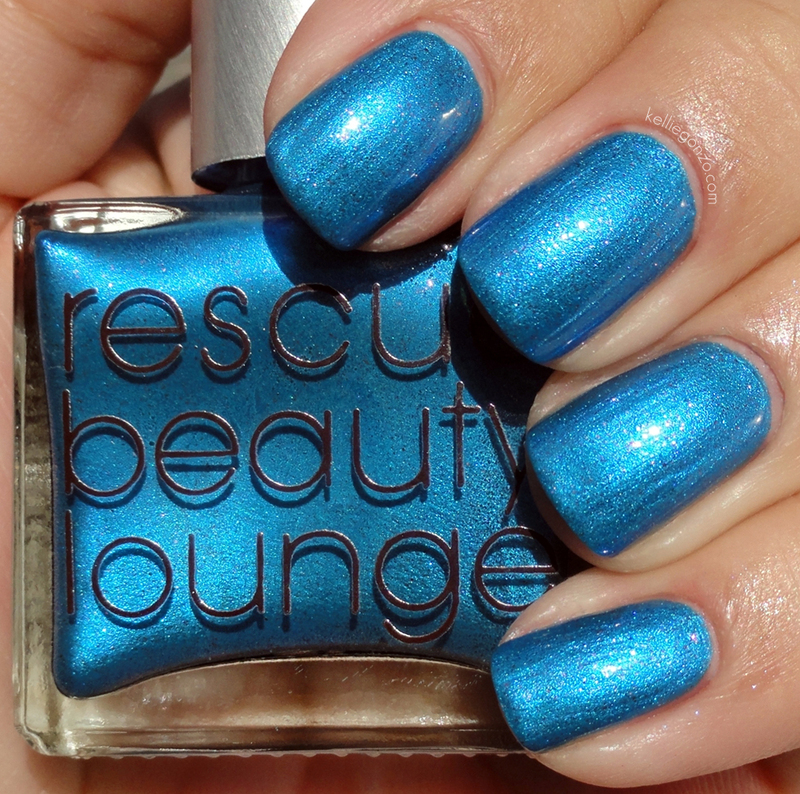 This polish is really spectacular and just off the wall in terms of fabulosity! My jaw dropped when I saw the bottle for the first time, not expecting to see the delightfully bold color; I couldn't quite picture the color Kaydi-Kat's envisioned back in 2011. The hot turquoise blue just radiates sun and fun, making me visualize being right there in the Maldives on the beach, admiring the gorgeous beach water Ji illustrated in her description. I adore the pink/almost purple, shimmer entwined in the water-like blue. This is two coats with topcoat. Here is Cuprum (Cu), the brainchild of Neeta: "The metamorphic moment when the presence of ammonia meets copper (II) transforms into a radiant blue. Cuprum is Latin for copper, and the dual nature of this element is what Neeta wanted to capture in a bottle." I really love this color combination, blue and copper are like best friends who just seem to come alive when in the presence of each other! Cuprum is an oceanic, almost metallic, shimmery blue with teeny copper glitter pieces throughout. I am really sad to say the copper is not visible in my swatch (shot in direct sunlight) but it IS visible in real life. This is two coats with topcoat. Last is IKB: 2012 from Nora: "A bright, vibrant, electric blue with blurple (blue-purple) in a jelly finish, hence, the creation of the most densely pigmented jelly-like finish I’ve ever made. Nora’s endless search for that Yves Klein signature blue (International Klein Blue) is finally over." 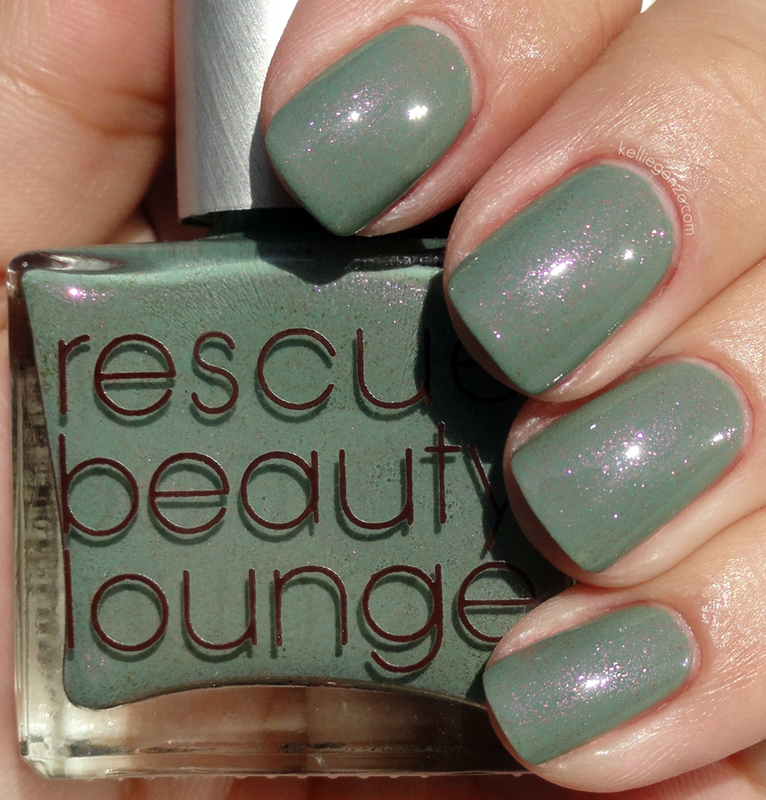 This color is so beautiful, it's almost impossible to describe how amazing it is. At first glance you could dismiss it as oh just another blue jelly. NAY. It is like I've found the holy grail of blue jellys! So pigmented, so happy and bright! A wonderful color on it's own and also a great base color for layering. This is three coats with topcoat. 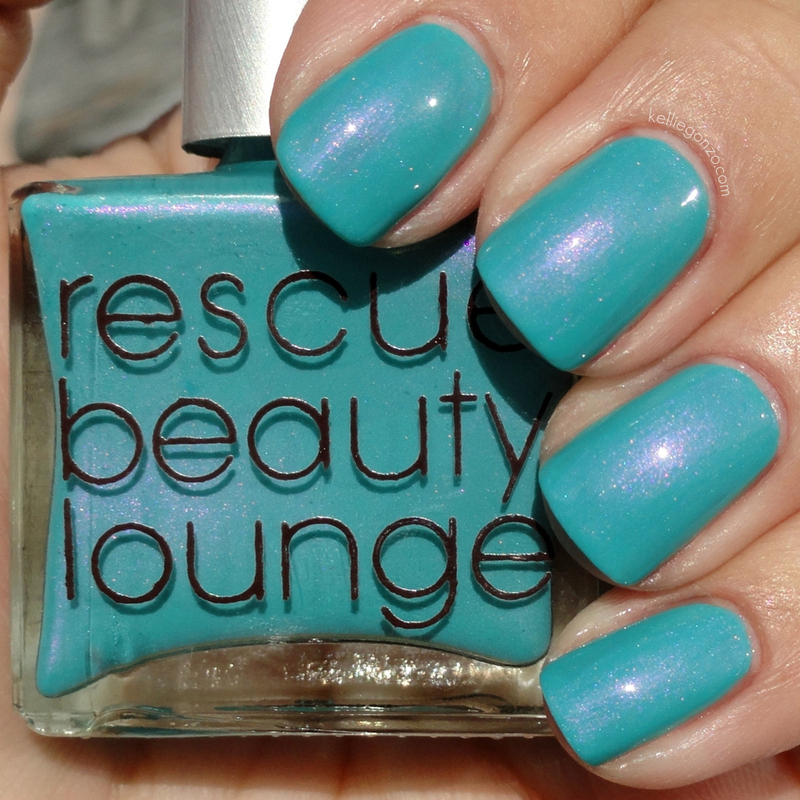 You will be able to purchase these around the end of April 2012 exclusively on www.rescuebeauty.com for $20 per bottle. I hope you enjoyed my review and photos, and hope you love these babies as much as I do! 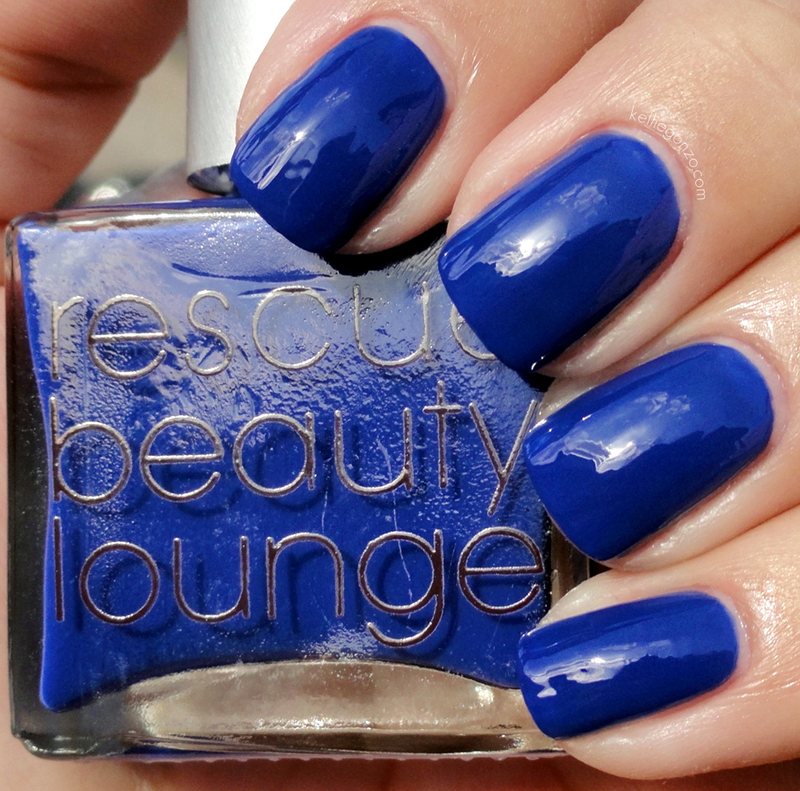 Rescue Beauty Lounge nail polishes are created with resin and high molecular polymers to improve flexibility, durability and high shine. They contain no harmful Toluene, Formaldehyde, DBP, Formaldehyde Resin and we do not test on animals.